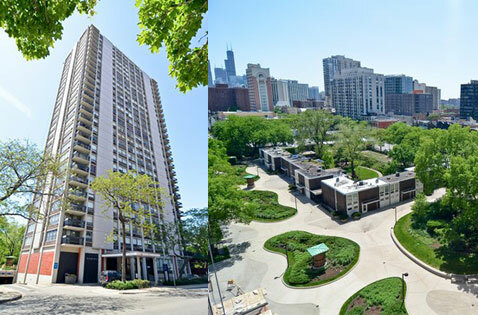 "1355 N Sandburg contains mostly 1 bedrooms condo units - very few 2 bedrooms are sold or available in any given year. East facing units offer views of the Gold Coast while West facing units at 1355 N Sandburg overlook a landscaped courtyard and walkway." 1355 N Sandburg Terrace - Dickinson House - is part of the Sandburg Village community of buildings in the Gold Coast. The 28-story building contains 243 condos and has a sister building adjacent at 1360 N Sandburg. Many condos in 1355 N Sandburg have been renovated over the years, so buyers will have a wide variety finishes to choose from when several units may be available for sale. 1355 N Sandburg does allow pets and leased parking is also available in the attached garage.